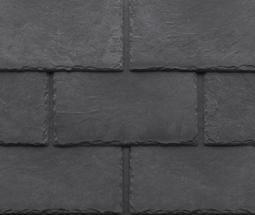 Tapco's Inspire slates are the world's finest synthetic roof slate, offering a prestigious, quick fix roofing solution. Almost indestructible (unbreakable even with a hammer). Welsh slate colour match. Currently available in 2 colours - plum + pewter grey. Each Inspire slate is made from recyclable plastic and dolomitic limestone and has the random texture and edges of natural slate. The slate is easy to handle + install: can be fixed by hammer + nail or nail gun. The lap or gauge as the Americans refer to it, is primarily determined by roof pitch and wind. 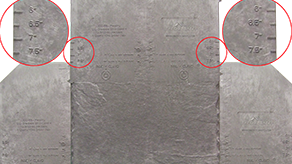 The gauge is imprinted on the top surface of each slate for ease of application. There are 4 options - 6, 6.5, 7 & 7.5 inches (the US use imperial measurements) that relate to roof pitch and thus the number of slates required to cover a square metre.